Birthday Party Activities for Kids, Tweens and Teen parties. Fun ideas to add to a birthday party or group activity! Choose your favorite birthday party activities to complement your party theme! 30 fun and creative games and activities to play with sidewalk chalk. These sidewalk chalk games are perfect for kids of all ages! Water balloons are great for spring and summer birthday parties! Our list has over 50 water balloon games and activities to keep everyone cool and having fun! These hula hoop activities are great for kids of all ages. The best games and activities using hula hoops - kids, tweens and teenagers. Our beach ball activities and games includes fun, unique and easy to learn indoor and outdoor activities and games that all use beach balls to play. One of our most popular pages for spring and summer birthday parties! Many great ideas for kids, tweens and teens - all ages! One of our girls favorite activities! Collect a large box full of all kinds of	fabulous items such as boas, tiaras, wigs, capes, fancy dresses, high heel shoes, sunglasses, hairpieces, long necklaces and big earrings. Tape off a long "runway" or use an outside walkway to walk down. Let them dress up and walk down the "runway" to fun music. Take pictures with a digital camera or video tape them so you can make them a CD or DVD of their birthday show. Hire a small petting zoo to come to your backyard and set up all sorts of animals for the birthday party. 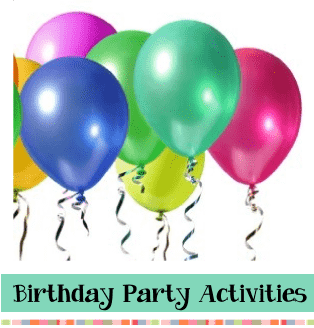 There are fun activities for all the birthday party guests! Some even have miniature pony rides that can set up in your backyard! Fun for all types of birthday themes - cowboy, western, barnyard, animal lovers, etc. Great activity for birthday sleepovers! Buy new pillowcases and wash them before the party. Set out fabric paints and permanent markers to decorate the pillowcases. Have everyone sign each other's on the back with the date of the birthday party. One of the best activities for a birthday party! They now come in every shape and color that you can imagine so finding one to go with your party birthday theme is easy! Check our Piñata Page for full details on this fun activity! Pony and miniature horse rides add excitement to a birthday party. They can complement almost any birthday party theme - cowboy, western, animal lover, zoo, Cinderella, circus, parade etc. The horses can be decorated to fit your theme with colorful ribbons in their tails and manes and some will even paint them pink and give them a horn to look like a unicorn or my little pony. Check for availability in your area on the Internet or phone book. Pricing varies throughout the US - pony rides average around $175 for 1 pony for 1 hour and about half of that for additional ponies or hours. Fun activity and birthday party gift for kids to take home. Buy T-shirts (I've used Hanes T-shirts in a package or bought them as low as $2 each at craft stores) and wash and dry them before the party. Set out fabric markers and fabric paints to use for decorating the shirts. Iron on letters are fun in all sorts of styles. Mix and match different styles to spell out their name or a funny saying. Tip: Use large grocery sacks, cardboard or poster board to place inside the shirt so the paint doesn't bleed through to the back of the shirt. Teens and Tweens really enjoy making and wearing these shirts. A good activity for birthday sleepovers or a longer party so the kids can print out pictures. Give each party guest a scrapbook. Set out scrapbook items so they can create a page about their friends and the party. Fun to do at birthday parties. Tie Dye kits can be found at craft and discount stores or you can buy Dye in little boxes at the grocery store in the laundry section. Wash and dry shirts before the birthday party. Give each guest a shirt and a bunch of rubber bands and have them take sections of the shirt and wrap rubber bands around it until the band is tight. Explain to them that everywhere there is a tight rubber band the shirt will stay white. Follow directions package, rinse out shirts and hang to dry outside. Making funky flip flops is a great party activity, craft and party favor! Girls of all ages love them ... kids, tweens and teens! Get full directions and pictures on our funky flip flop craft page. Set up a Treasure Hunt for the birthday party by writing out clues that lead from one place to the next around the party areas. See our Treasure Hunt ideas	for help on planning and set up. Make fun pom pom's on a stick to use for decorations or party favors! Our easy video shows how to make Rooter Pom Poms	quick and easy! Directions and instructions for making these fun birthday crafts for a birthday activity - tutu skirts, picture frames, hats, flip flops and more! Squirt gun activities and party games for outdoor summer fun! Lots of fun and creative ideas for boys and girls birthday parties. Party Games for all ages!